Born in St.Helier, Jersey, Banahan's career sparked into life when he traded the back-five of the scrum at the London Irish Academy for Bath and a place in the back-three. 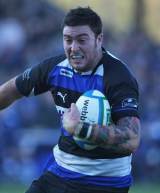 At 6' 7" and over 18 stone, Banahan's power is his major asset and was immediately evidenced as he scored 16 tries in his debut season at The Rec. In 2008, he made his England Saxons bow, having already represented the Sevens side, and made his full Test debut in 2009 against Argentina at Old Trafford. He scored tries in his first two Tests, both against the Pumas, and added a third when the sides met at Twickenham the following November. In 2010, he toured Australia with England and notched a try against the Australian Barbarians in a midweek match. While he was unable to force a Test recall on tour he was deployed at outside-centre against Samoa the following November, scoring a try and sparking talk of a midfield rethink. He continued to catch the eye on the domestic stage and retained his place in the England set-up for the 2011 Six Nations and appeared as a replacement centre in the games against France and Scotland. In a season where Banahan scored a storming hat-trick against Premiership rivals Northampton Saints, he was named in Martin Johnson's 45-man training squad for the World Cup. Banahan was selected in the final 30-man squad and made three substitute appearances in New Zealand. But ahead of the 2012 Six Nations, Banahan failed to keep his place in the EPS and had to be content with a spot in the Saxons instead.